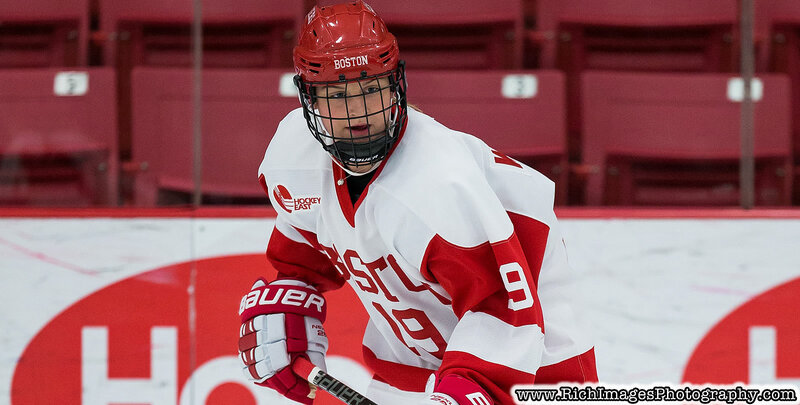 BURLINGTON, Vt. - Sini Karjalainen and Anna Erickson registered their first career goals, but eighth-ranked Boston University (15-6-6, 12-5-5 WHEA) downed the Vermont Catamounts (7-17-4, 5-14-2 WHEA) in front of 1,967 fans on Pack the Gut night Friday at Gutterson Fieldhouse. "I want to thank the 1,967 people who came out to tonight's game," said head coach Jim Plumer. "The energy in the building was fantastic. They deserved a better effort from our team." - Vermont jumped out to a 1-0 lead on Karjalianen's goal at 4:19 in the first period. The rookie defender received a pass from Taylor Flaherty and wristed a shot through traffic to beat Corinne Schroeder (16 saves). Theresa Schafzahl had the secondary assist. - BU answered with three quick goals to close out the opening frame. Deziray De Sousa beat Melissa Black (18 saves) on the power play just past the midway point of the period to tie while Mackenna Parker and Sammy Davis found the back of the net to go up by two through the first 20 minutes. - The Terriers continued with two goals in the first 12:51 of the second period on goals by Emma Wuthrich and Jesse Compher. - Erickson answered with her goal at 13:36 of the middle frame to spark a surge by the Catamounts. The sophomore defender beat Schroeder with a wrist shot from the right circle for her first career marker. Schafzahl and Sammy Kolowrat assisted on the goal. - Vermont had a surge of offense after Erickson's goal, but the Terriers netted two goals early in the third period to stop the momentum. - The crowd of 1,967 fans was the third largest in Pack the Gut history. - Sierra Natzke entered the Vermont goal in the third period and registered four saves. UVM teamed with the Headway Foundation to participate in the 2019 Concussion Awareness Weekend. All proceeds from the CAW went to support the New Tough Concussion Awareness Campaign. The Catamounts return to action Sunday (Feb. 3) for a Hockey East matchup at Holy Cross. The afternoon game will be broadcasted on NESN at 1 p.m.